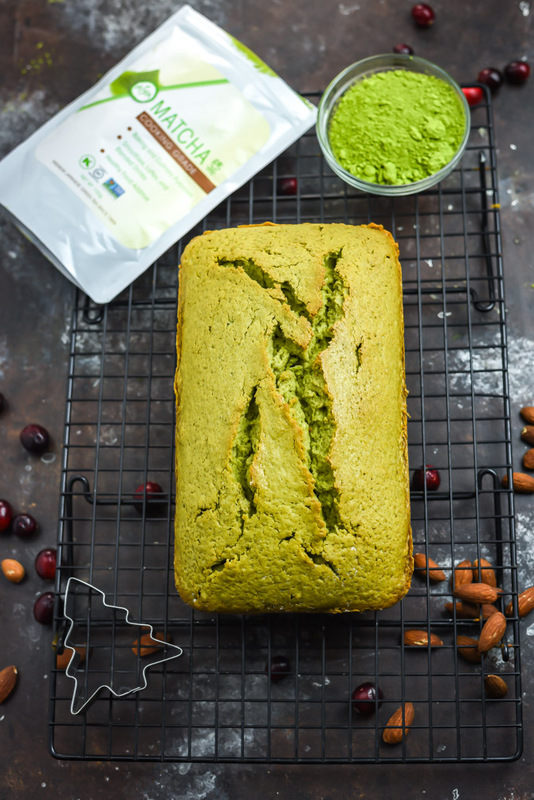 This delicious pound cake has been sponsored by Aiya America, who inspires my matcha Christmas creations year after year. 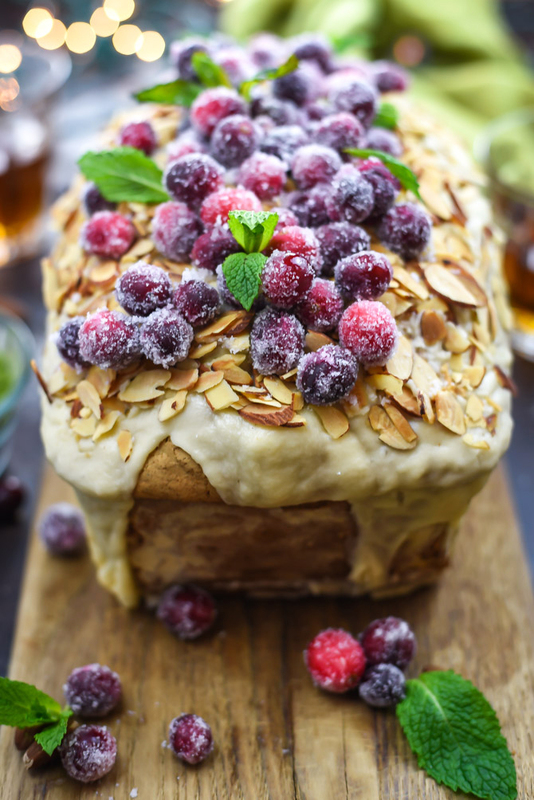 I used to be firmly in the cookie camp, but this year I’ve got to say that my new favorite Christmas dessert is actually pound cake. 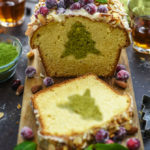 Specifically, a dense, moist, and sweet pound cake that’s drizzled with an Amaretto-spiked glaze and hides a matcha-flavored Christmas tree in every slice. 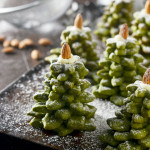 Is the Amaretto-Matcha Christmas Surprise Cake more delicious or adorable? I honestly don’t even know. There’s something about matcha that makes me want to use it every Christmas season. Maybe it’s the way that the earthiness of the green tea brings balance to super sweet desserts. Maybe it’s the slight richness and sweetness that it has itself. Maybe I just really love the fact that it’s chock full of chlorophyll (and therefore naturally super green) and I can make little wreaths and trees with it without having to use food dye. 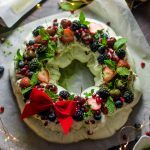 Whatever the reason may be– ahem, all of the above— I can’t resist adding it in to recipes that range from cookies to pavlovas once the holidays roll around. Luckily, it’s got a lot of health benefits that make me feel sliiiightly less bad about the platefuls of baked goods I’m downing this time of year. 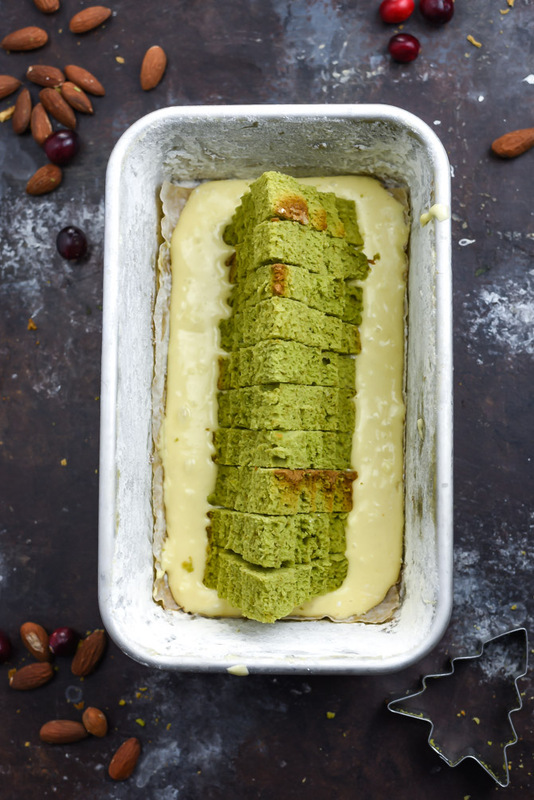 Also, when it comes to baking with matcha, we’re actually able to use the less expensive stuff (AKA cooking-grade matcha) because it’s got a stronger flavor that can shine through all of the other dessert ingredients. 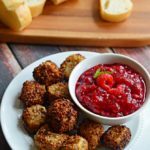 Better baked goods without breaking the bank– ya gotta love it! 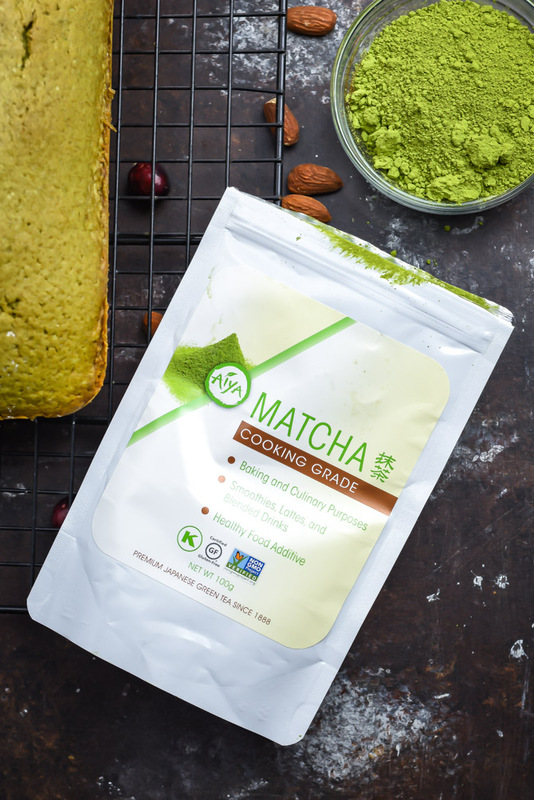 You can get your cooking grade matcha through Aiya America here, by the way. …Maybe. I do love a good Amaretto Sour. Thankfully, this recipe only requires a bit of amaretto, so I can have both. Quite the win-win. A few years ago, my Omi (that’s German for grandma) brought a pound cake to my house that was soaked in amaretto and told us all that it was a “classic German Christmas Eve recipe.” One thing I’ve learned from my Omi is that either all German recipes contain suspiciously Italian ingredients, or my Omi just claims that every recipe she makes is “classically German,” even if she learned it from her Italian-American neighbors here in the states. Judging by the fact that she thought veal parmigiana was German, I’m going to say it’s probably the latter. Anyway, regardless of where the recipe came from, that pound cake was SUPER delicious. I was in love with it! And I’ve been obsessed with the idea of incorporating amaretto into my pound cakes ever since, but the right recipe just wasn’t clicking for me. 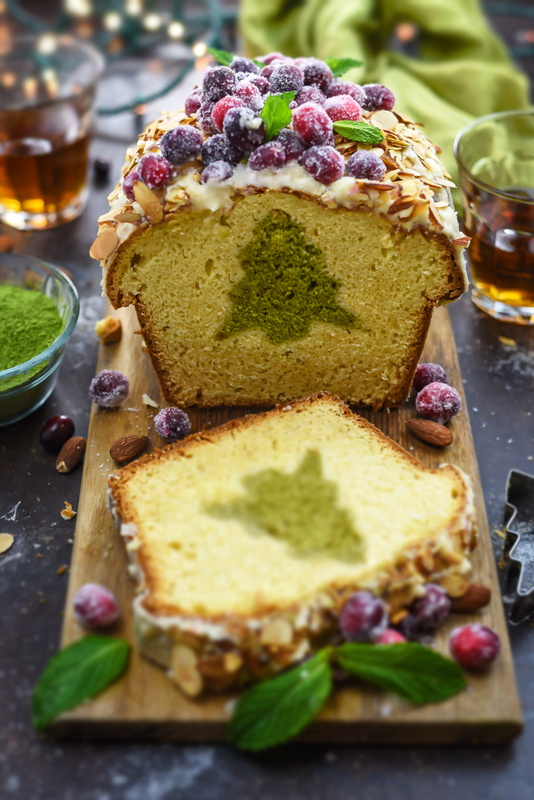 Not only do I think the flavor in this Amaretto-Matcha Christmas Surprise Cake is phenomenal, but it also looks pretty impressive, don’t you think? I love the fact that the little Christmas trees make it seem like I’ve got some insane baking skills rather than a cookie cutting hack up my sleeve. “I’m never telling! The mystery dies with me!” I reply. And here we are. Drooling over this maybe-better-than-cookies Christmas dessert and I’m teaching you just how to make it. Prepare the first box of pound cake according to directions, but replace up to 1/3 cup of the liquids with amaretto (or add in 2 tablespoons of amaretto if no liquid ingredients are called for), and add in 2-3 tablespoons of matcha, depending on how strong you’d like the matcha flavor to be. 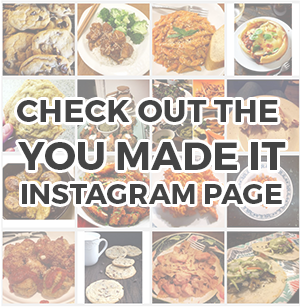 Prepare and bake in a 9×5-inch loaf pan according to the directions. Let cool completely. 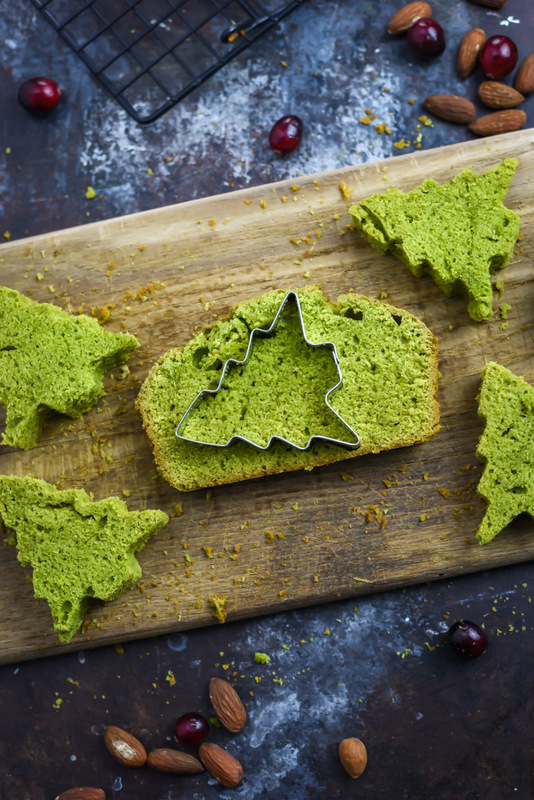 Cut the matcha pound cake into large slices and use a small* Christmas tree cookie cutter (or cookie cutter of your choice) to cut shapes from the pound cake. Place the cut-outs on a baking sheet, cover, and freeze for at least 2 hours. This will help the cut-outs to keep their shape and prevent over-baking. Prepare a second box of cake mix the same way you did the first, but without matcha this time. Butter and flour the loaf pan and spread a near-paper-thin layer of the new batter at the bottom, just to help the cut-outs stand upright. Any more than just a teeny tiny bit of batter will expand and push the cutouts up too much, so make sure to keep it thin. Then, align the cutouts down the center of the pan, making sure there’s no space between them. Leave space around the edges so the cutouts are not visible from the front or back of the cake. Fill the rest of the way with the batter. Depending on the size of your cut-outs, you may need to make the second box of pound cake mix and use some to finish covering the cut-outs. Be careful not to overfill the pan, but be sure to cover the tops of all of the cut-outs fully. Bake until a skewer inserted into the base comes out clean. Usually this will take slightly longer than the package directions imply, so don’t worry, just test every 10 minutes after the package-stated time has passed. As the cake bakes, prepare the amaretto frosting. In a large bowl, cream the butter with a hand-mixer until light and fluffy. 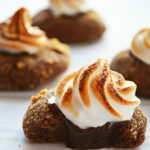 Beat in the confectioner’s sugar and then add amaretto, a bit at a time, tasting and adjusting until flavored as desired. If needed, mix in heavy whipping cream to thin. Set aside. As the cake cools, spread the slivered almonds on a large baking sheet. Bake at 350°F for 3-4 minutes, then mix. Bake for another minute, or until toasted. Let cool. When the cake has fully cooled, spread the amaretto frosting over the top. 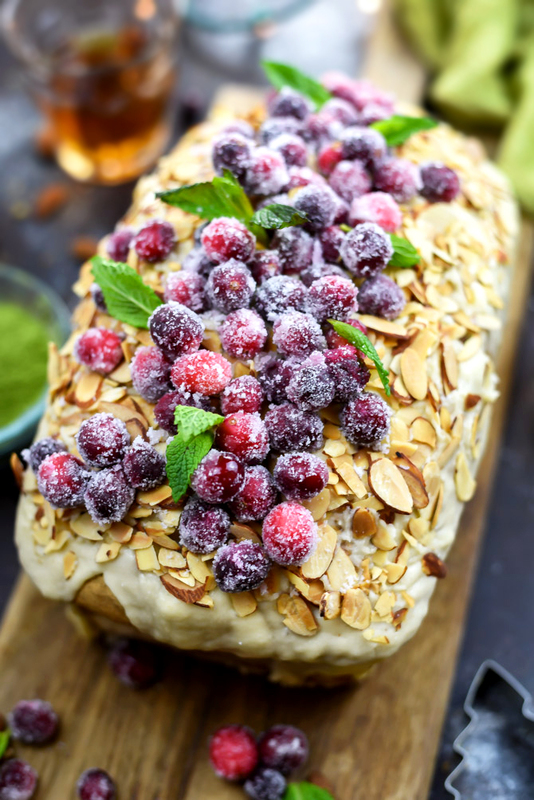 Gently press slivered almonds into the frosting and top with sugared cranberries and mint, if desired. Serve. Make sure that your Christmas tree cookie cutter is no more than 2 1/2 inches tall. If your cut-outs won’t fit fully in the baking dish without popping up at the top, you need a shorter cookie cutter. Stars, hearts, snowflakes, and holly leaves are good alternatives that usually are smaller, if needed.